Poster print featuring artwork Reverend Robert Walker (1755 - 1808) Skating on Duddingston Loch by Sir Henry Raeburn. From the collection of the National Galleries of Scotland. 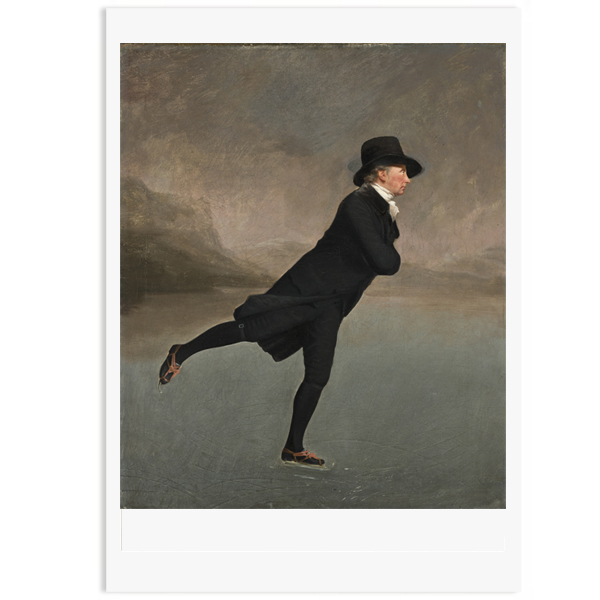 This serene skater is thought to be the Reverend Robert Walker, minister of the Canongate Kirk and a member of the Edinburgh Skating Society. The club - the oldest of its kind in Britain - usually met on the frozen lochs of Duddingston or Lochend on the outskirts of Edinburgh. Walker's pose, as he glides across the ice, looks effortless, but would have been recognised by fellow skaters as a difficult and sophisticated manoeuvre.